On Siena College Week: Slow down at your next meal. Marcela Garces, associate professor of Spanish at Siena College, examines how a different culture enjoys their meals differently than our fast food culture. 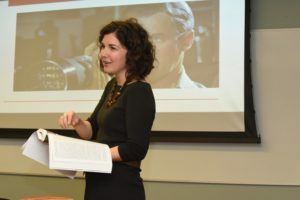 ​​Marcela T. Garcés is an Associate Professor of Spanish at Siena College near Albany, New York, where she co-founded the Film Studies Minor. Her research focuses on contemporary Spanish cultural studies. She has authored articles on la Movida madrileña (the post-Franco Spain countercultural movement); contemporary Spanish film, and fashion studies. Most recently, she wrote the script for the documentary film The Txoko Experience. The Secret Culinary Space of the Basques (2017). The word ‘txoko,’ spelled with a “T X,” means ‘corner’ in the Basque language, in the sense of being a cozy, secret place. Txokos are an important part of culinary culture in the Basque Country in Northern Spain. They are also called “gastronomic societies,” which communicates the social aspect of these spaces. Having existed since the late 19th century, they are still thriving today. Our documentary team recently interviewed Michelin star chefs Josean Alija, Victor Arguinzoniz, Aitor Arregi and Elena Arzak for a film called The Txoko Experience. The Secret Culinary Space of the Basques that explores the tradition of Basque txokos and how they provide cultural and culinary inspiration for these highly regarded restaurants. Txokos exemplify the Slow Food movement, as people truly enjoy the process of selecting the best ingredients, preparing them with care, and savoring these delicious meals in community. How do txokos function? First, you have to be a member (or be acquainted with one) to enter. Each one has a wine cellar and a pantry equipped with basic supplies, and an industrial kitchen. Typically, a few members make a trip to the market to buy fresh fish, meat, bread, and produce for the meal. Then, usually on the weekends, the members meet to prepare meals together. Traditional, time-consuming recipes are often prepared in txokos, and these spaces and gatherings are responsible for maintaining these recipes, and sharing knowledge about new ones as well. Multiple courses are served family style over several hours. After the meal, people take part in “la sobremesa,” which includes talking, singing, joking, playing cards, and having drinks: this can easily last over two hours. Txokos – and the Michelin-starred restaurants they inspire – show us a relaxed pace to preparing and eating traditional meals in community, something we might do well to emulate.